In this part, I’m going to look at everything else. Housing has continued to be a huge area of discussion and concern this year. We finally started to see some action on housing by the former government, but while more was done with initiatives such as the Housing Infrastructure Fund, they still failed to acknowledge that they needed to just build more houses. This is something the new government are promising to do but we’ll have to wait to see what eventuates. Right at the end of the year, Auckland Transport gained a new CEO, Shane Ellison, to replace David Warburton who was at the end of his contract. He’s only been in thIe role a few weeks and we’re keen to see how he changes the organisation. Transport and Housing featured more strongly in this election than any I can recall, especially initially. Labour launched their campaign by announcing support for the CFN while National, on the same day, announced electrification to Pukekohe and other improvements. As the election progressed we had National promising new roads in almost every electorate. It later emerged that transport also played a big role in the negotiations between Labour, NZ First and the Greens. Projects like Light Rail through the isthmus and to the airport, and a rail spur to Marsden Point have been specifically mentioned as occurring under this government. Housing and Transport are two sides of the same coin and so Jacinda Ardern’s to put both of these crucial portfolios under one minister in Phil Tywford been a great outcome. Even better is that so far Phil has been saying all the right things, to the point that sometimes he’s almost a walking blog post, not that that’s a bad thing. 2018 looks to be an interesting year under both of these portfolios. The GPS sets the high level policy and funding levels and so is a critical document. 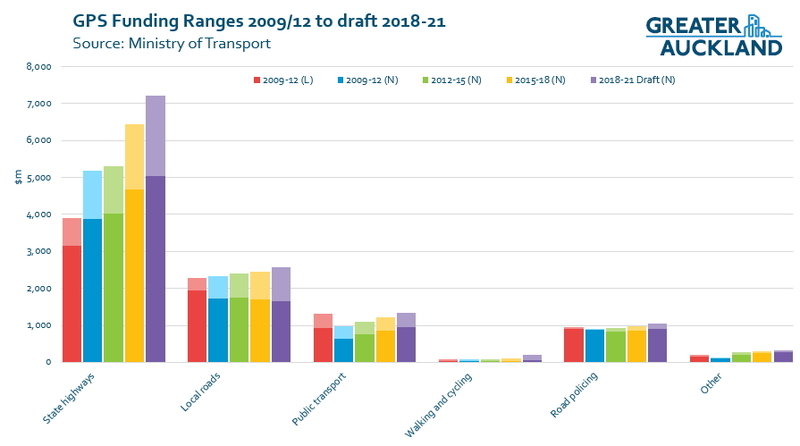 The draft 2018-21 GPS was released earlier this year and continued the policies of the previous government with most money going towards big roading projects. Phil Tywford has already indicated there’ll be some positive changes to this before it is finalised. We’ve had another fantastic year on the blog. This year we’ve had some massive changes. we rebranded from TransportBlog to Greater Auckland and updated the look of the blog at the same time. As mentioned in the PT wrap-up, we also launched the Congestion Free Network 2 and Regional Rapid Rail, for which we had incredible responses, including being adopted by the new government. We’ve had around 29,500 comments, and the most commented on post, with a record 595 comments was when we introduced Regional Rapid Rail (the previous highest for comments had 385). According to Google analytics, this year we’ve around 370,000 unique users, over 1.1 million sessions and around 2.1 million page views. As you would expect, NZ is the largest source of our visitors with 82% based here. Delving deeper, 63% of all views come from Auckland, which is no surprise given Auckland is our focus. I hope we do see a lot of positive changes to the above things by the new government. Certainly won’t be hard to do even slightly better than the previous government which couldn’t give a rats about the majority of Kiwis. Thanks for an interesting lot of posts & comments for the year. Yes Regional Rapid Rail sure got a lot of interest, helped out by Blair’s 100+ comments. Thanks for all your great content and advocacy.